Revengeofthe5th.net: Is this the first look at Princess Leia from The Force Awakens? Is this the first look at Princess Leia from The Force Awakens? OK folks, take this rumor with a grain of salt. The Hashtag Show on YouTube released this photo, which they claim is of Carrie Fisher in costume as Princess Leia in The Force Awakens. 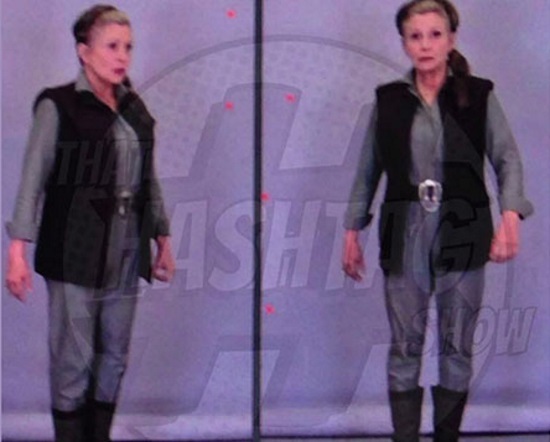 While it appears to be a photo from a costume fitting, and the outfit resembles a previously-released costume sketch for Leia's character, the poor quality of the photo makes it impossible to verify. However, the costume does closely resemble an outfit seen briefly in the trailer, worn by the person being handed a lightsaber, which Luke's voice-over refers to as Leia. If it is real, it is awfully cool, and hopefully we'll see confirmation soon, either from an official photo or the upcoming action figure line.